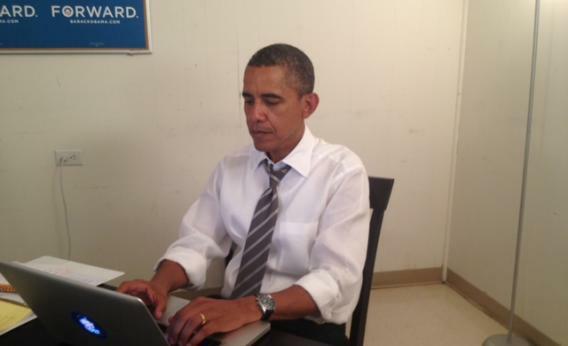 Obama Reddit AMA: President answers questions, avoids controversy on online forum. 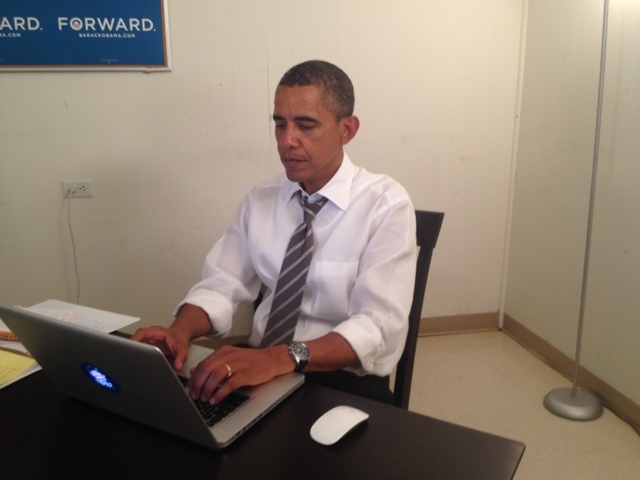 President Obama posted this photo of himself to Reddit as verification of his identity. Also in Slate, Ben Johnson and Katy Waldman run through the 10 questions from Redditors that Obama should have answered. “Hi, I’m Barack Obama, President of the United States. Ask me anything,” Barack Obama wrote at 4:15 p.m. eastern today. “Welcome to Reddit, Mr. President,” deadpanned TheAtomicPlayboy. “Coolest president ever?” wondered GirlPart. “ONE OF US. ONE OF US,” chanted DirectCharge. Now that his half-hour AMA is over, it’s safe to conclude that President Obama is not ONE OF US. In theory, Reddit is the rare online forum that could actually goad a big-time politician into discussing topics that his campaign would rather avoid. While its users skew young and liberal, they also have a strong libertarian and anti-authoritarian streak. Redditors are also notoriously tough interlocutors, gravitating to the most awkward and challenging questions. And the site’s structure reinforces the potential for fireworks by pushing the most popular questions to the top of the page. The OP can ignore them if he likes, but he can’t make them go away. But Obama and his team surely took all of that into account. An AMA that lasted just more than 30 minutes (many of the more substantive ones can last hours) gave the president the cover he needed to skirt any lines of inquiry that might draw him too far off-message. Internet freedom is something I know you all care passionately about; I do too. We will fight hard to make sure that the internet remains the open forum for everybody—from those who are expressing an idea to those to want to start a business. And although there will be occasional disagreements on the details of various legislative proposals, I won’t stray from that principle—and it will be reflected in the platform. A concrete question about the space program—are you considering increasing funds for it?—elicited a similarly noncommittal response. And in no instance did Obama engage in the sort of back-and-forth exchange of ideas that often makes AMAs so entertaining. In short, the president’s Reddit visit was no more illuminating than any other social-media debate or interview. No online interrogation has yet managed to eclipse the modest bar set by a standard TV sit-down, which at least has the virtue of forcing the candidate to engage repeatedly and in real time with a single, persistent questioner. Redditors themselves may well forgive Obama his brief and altogether unilluminating appearance on the site—this once. The president’s first foray on to “the front page of the Internet” flattered the site’s denizens, who were taken aback that Obama would deign to appear on the site. But if he comes back, Redditors won’t be so tolerant of evasions and boring answers. And that’s why the president first AMA will likely be his last.